Before the Class A Loons sent their pitcher to the mound Thursday, Cody Thomas and Carlos Rincon pulled off a very rare feat in the top of the first inning. An out hadn't been recorded yet when the outfielder and the Dodgers No. 24 prospect belted back-to-back homers. Later in the same frame, the duo provided an encore. "I was definitely very excited, but shocked at the same time," Great Lakes manager Jeremy Rodriguez said. "I've never seen that before, so it was nice to see those two guys do what they did tonight and have the success that they did." After the 11-run inning, the Loons rolled to a 16-5 victory over the Dragons at Fifth Third Field, but not before Thomas went yard again. He set personal and team records with three homers and seven RBIs. "It was just 'see ball, hit ball.' Keep it simple," Thomas said. "They gave me good pitches to hit early in the count and I just attacked them. The result was the result, but nothing too crazy, didn't overthink it." In 96 games this season, the 13th-round pick in last year's Draft is hitting .235/.293/.434 with 18 homers and 58 RBIs. Rincon also has gone yard 18 times while plating 47 with a .199/.267/.425 line over 79 contests. 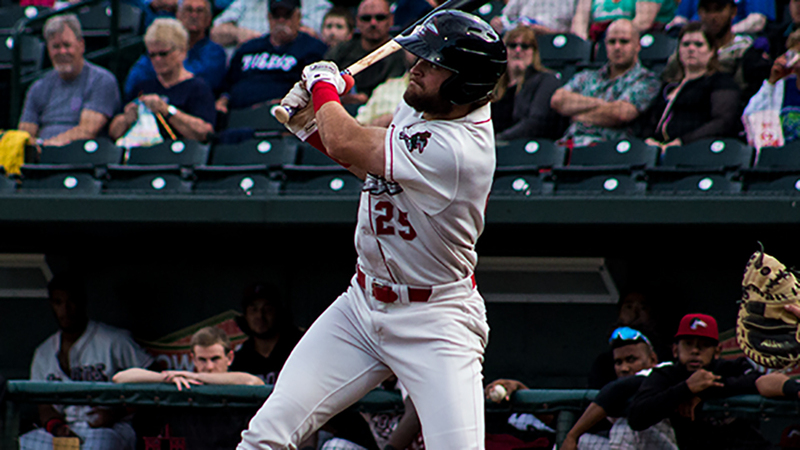 Jared Walker also went deep twice Thursday, driving in a professional-best four runs. The 21-year-old has been on a power surge of late with five homers in the past three games. Walker contributed his first dinger to left-center field in the Loons' big opening inning against rehabbing big leaguer Anthony DeSclafani, who allowed the first set of consecutive blasts -- Thomas to right and Rincon to left-center. The right-hander was diagnosed with a UCL sprain in March and has not made an appearance with the Reds this season. He recorded only one out Thursday night and was tagged for eight runs on eight hits. Thomas said the Great Lakes hitters discussed DeSclafani's five-pitch mix in their usual pregame meeting. "Obviously, you got to eliminate some of those and really just trying to stick to your plan," the 22-year-old explained. "I think that's what we did a good job of, keeping it simple and attacking the fastball early in counts." After DeSclafani's exit, which the team said was the result of forearm discomfort, the Dragons turned to right-hander Jesse Stallings, who got leadoff batter Saige Jenco to fly to right before ninth-ranked Dodgers prospect Gavin Lux reached on an infield single. Thomas smacked his second homer of the inning over the fence in center and Rincon followed with a shot to left. "After it happens a second time, you know, we're having fun with it," the University of Oklahoma product said. "This is a game. It was really cool to see him get another one. I think that was the coolest part about it. We weren't really putting pressure on ourselves, just going out there and having fun." Both Walker and Thomas lofted long balls to right-center in the fifth to provide Jordan Sheffield, the No. 10 Dodgers prospect, with a 14-run lead. Sheffield yielded only one hit over the first seven innings in what Thomas called the right-hander's best performance of the year. The skipper, who agreed with that assessment, sent the Vanderbilt product back out for the eighth. "I think he was confident, he was working all of his pitches for strikes," Rodriguez said. "He was aggressive early. Something that he's been struggling with early in the season is he falls behind hitters real easily. That was a big key for him tonight. He didn't fall behind, he was aggressive and he got quick outs." Sheffield struck out Michael Beltre to start the eighth, but three consecutive singles loaded the bases for Jose Siri. In the midst of a 38-game hitting streak -- the longest in the Minors this season, the No. 24 Reds prospect had been held hitless in prior three at-bats. Siri took a hack at a first-pitch breaking ball and landed it just beyond the reach of Thomas in center for a bases-clearing double. "I really wanted to catch that ball for Sheff," Thomas said. "I couldn't care less who was hitting or anything like that, but to not get to that ball kind of left a bad taste in my mouth. Nothing toward Siri or anything like that, I just really wanted to catch that ball for Sheff." The Tennessee native finished with five runs allowed on five hits and a career-high 10 strikeouts over 7 1/3 frames in his longest professional outing. Lux amassed two doubles, a single, three runs and a pair of RBIs for the Loons.